It’s almost Christmas. It’s that time of year to enjoy friends, family, and, arguably the most important aspect, food. 😉 The best thing about holiday baking is all the spices that you’re expected to use. 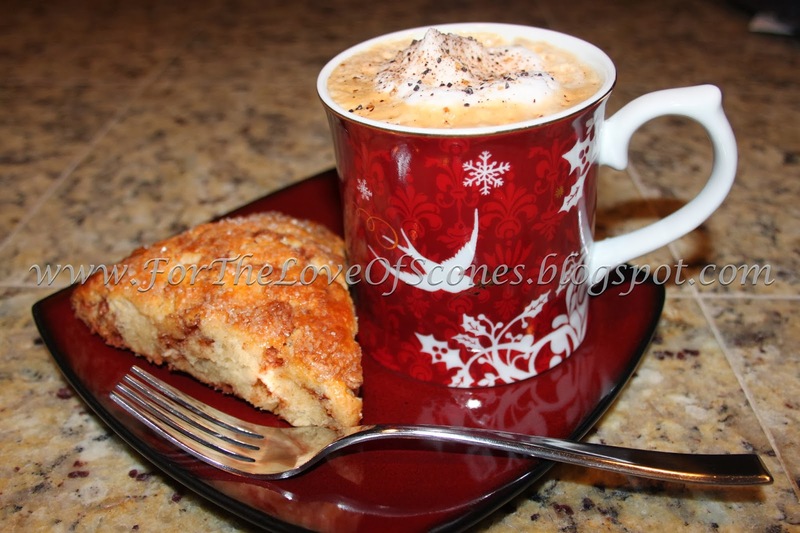 Aromatic cinnamon and spicy nutmeg…my mouth waters just thinking of it. and a homemade latte to go with? 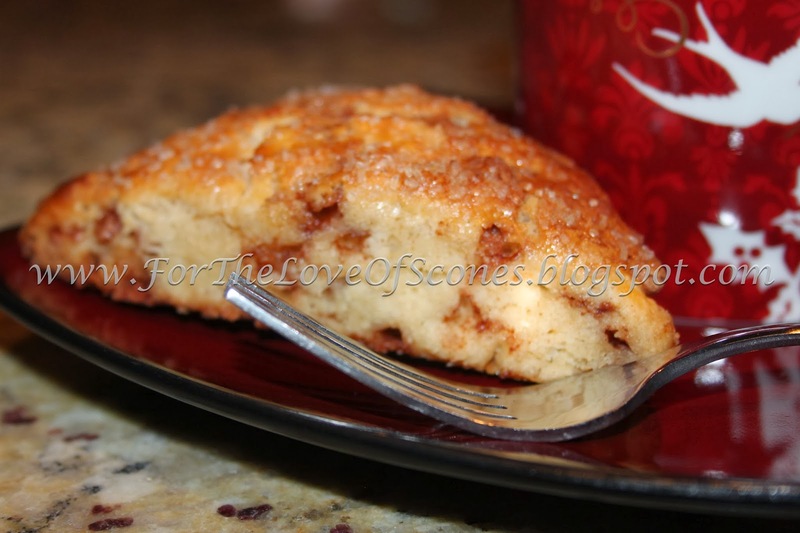 When my husband requested eggnog scones this past week, I was more than happy to oblige. Although I enjoy eggnog as a holiday treat, I’ve never actually baked with it. However, my favorite parts of eggnog are all the spices, so how could I resist? After trolling around on the Internet, I found a recipe (link to original below) that I was willing to adapt for my purposes, and it’s been made twice this past week for two separate tasting groups, each of whom loved this recipe. *I doubled the recipe, which is why I have two sticks of butter and two eggs. You should only need one of each. Work in the butter. Some larger, pea-sized chunks are okay. Add the cinnamon chips… as much or as little as wanted. Mix in with a wooden spoon until it looks even. 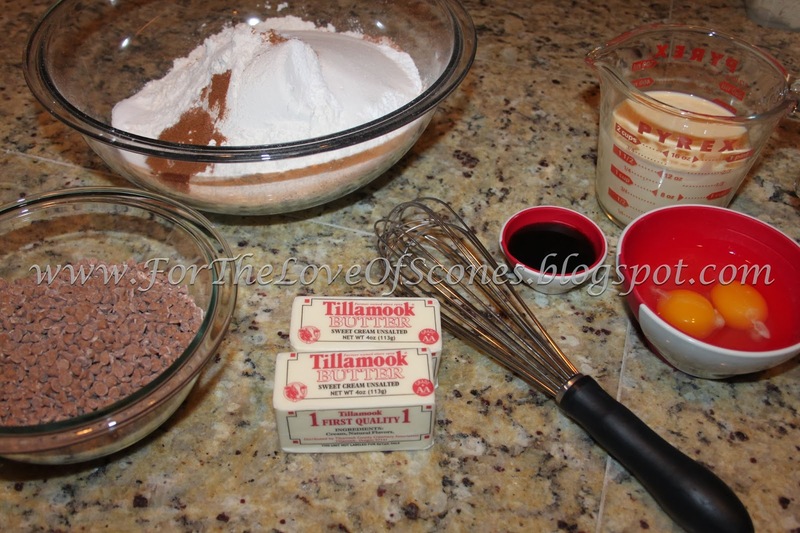 Aside, whisk together the eggnog, egg, and vanilla bean paste. Add the liquid to the dry ingredients. Mix until it mostly comes together; a few dry bits are okay. *I made a double recipe, so I quartered mine. If you’re following the recipe, you should only divide in two. Flatten into an 8- or 9-inch round and cut into six triangles. Place the scones in a round close to each other, perhaps an inch apart. I placed mine a little closer because I was short on baking sheet space. Bake until deep golden on top. 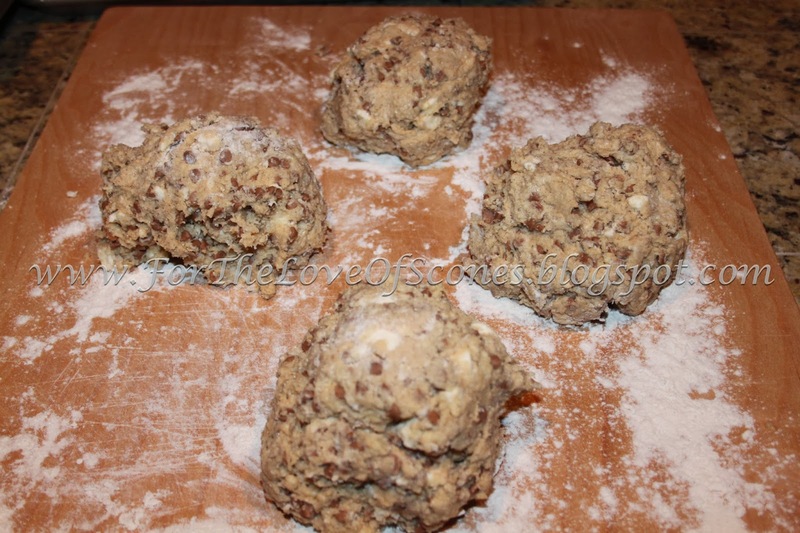 When you pull the scones apart at the seams, the middle should not be doughy. Allow to cool for a few minutes, and enjoy! 1. 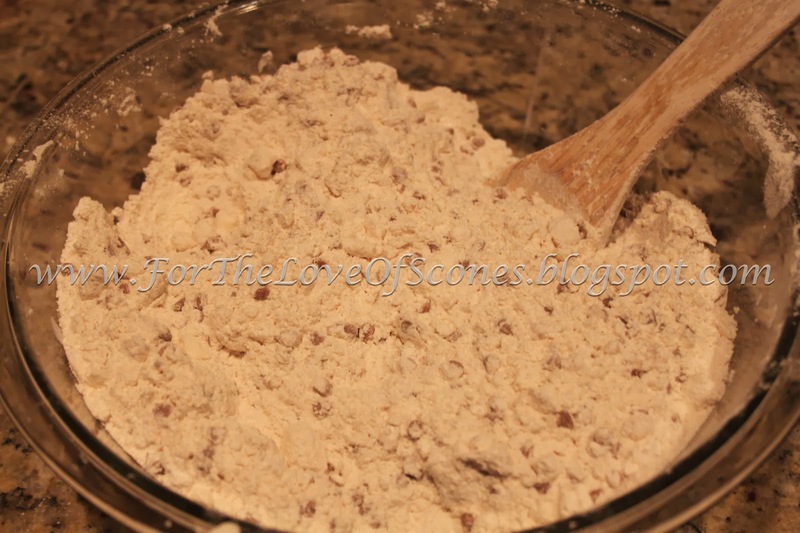 Combine the dry ingredients, flour, sugar, salt, baking powder, ground nutmeg, and ground cinnamon and whisk to mix well. 2. 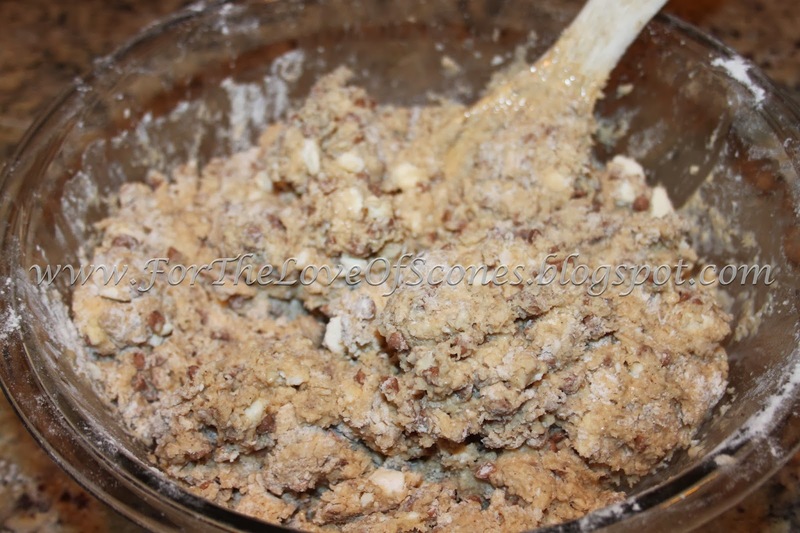 Add the chopped butter and, using a pastry blender, mix until well combined. A few pea-sized chunks are okay. 3. 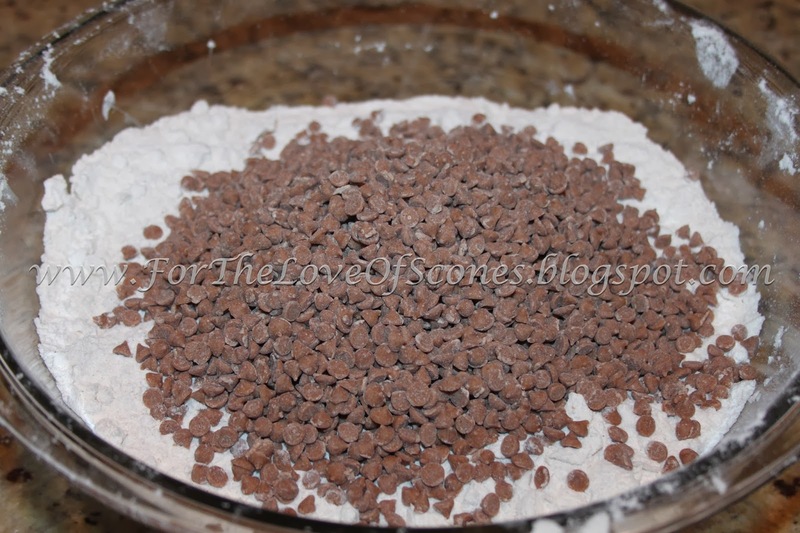 Add the cinnamon chips and stir with a wooden spoon to mix. 4. Measure out 3/4 cup of eggnog and set aside an additional 1/4 cup. 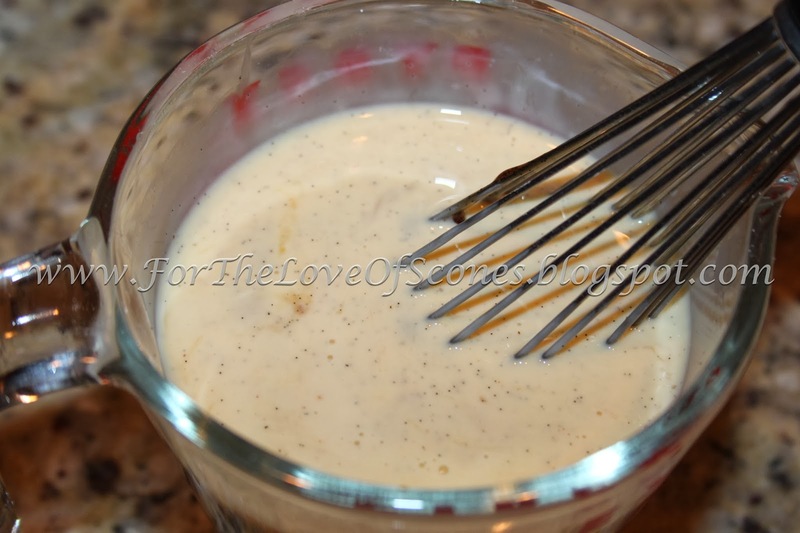 In a medium-sized measuring cup or bowl, combine the egg, 3/4 cup eggnog, and vanilla paste/extract. Whisk lightly to mix evenly. 5. Add the liquid to the mixture. If you need the additional 1/4 cup eggnog, add it a tablespoon at a time until your dough just comes together with a little bit of dry bits okay. 6. 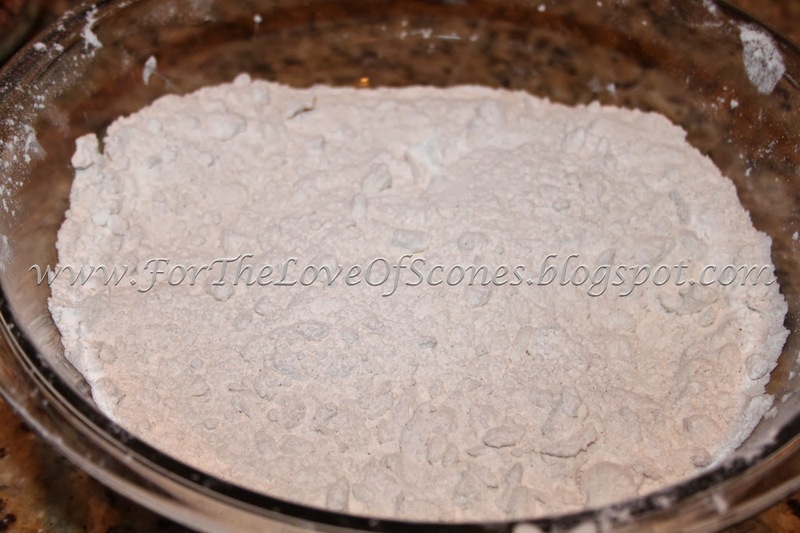 Turn out onto a lightly floured countertop and divide dough in half. 7. Flatten each half into an 8- or 9-inch round and cut into six equal triangles. 8. 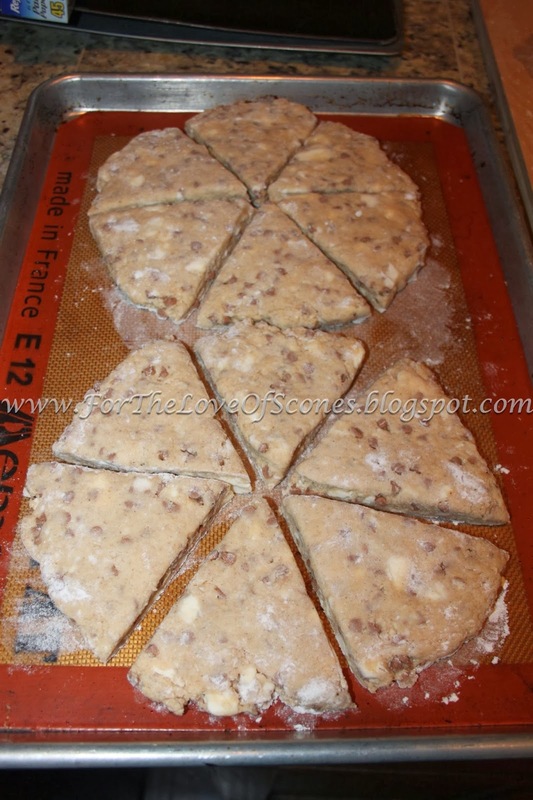 Transfer scones to a parchment-lined baking sheet and arrange the triangles in rounds with sides about half-inch to an inch apart. 9. 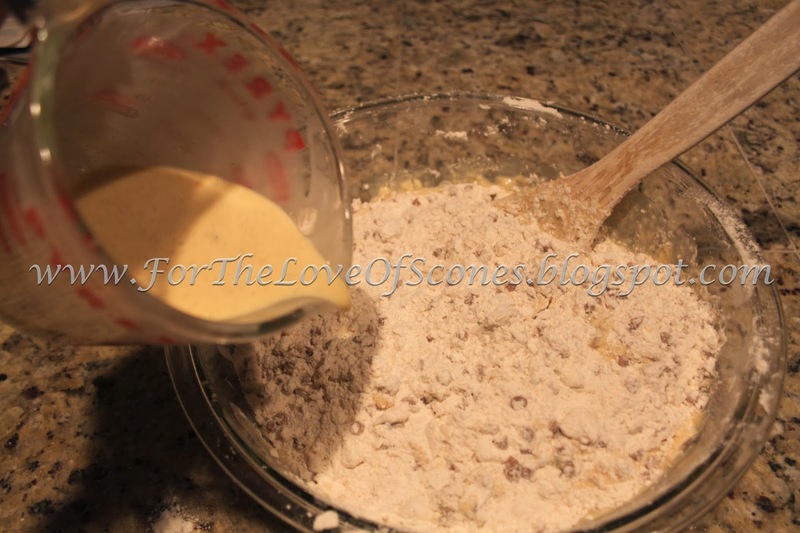 Brush the scones generously with eggnog and sprinkle with sugar. Place in freezer for at least 30 minutes. 10. Preheat the oven to 425˚F. 11. Bake for 20-25 minutes or until deep gold on top. 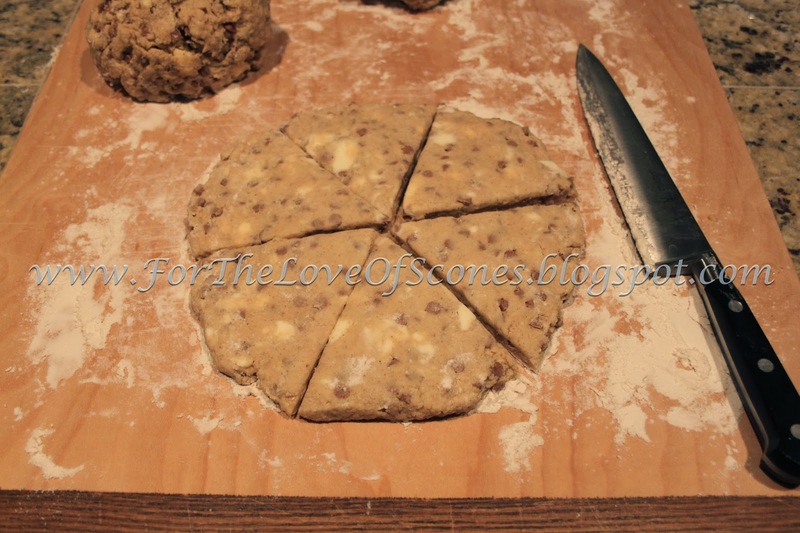 To check if the scones are done, pull them apart at the seams and check the middle. 12. Remove from oven and allow to cool on a cooling rack. Best served warm. 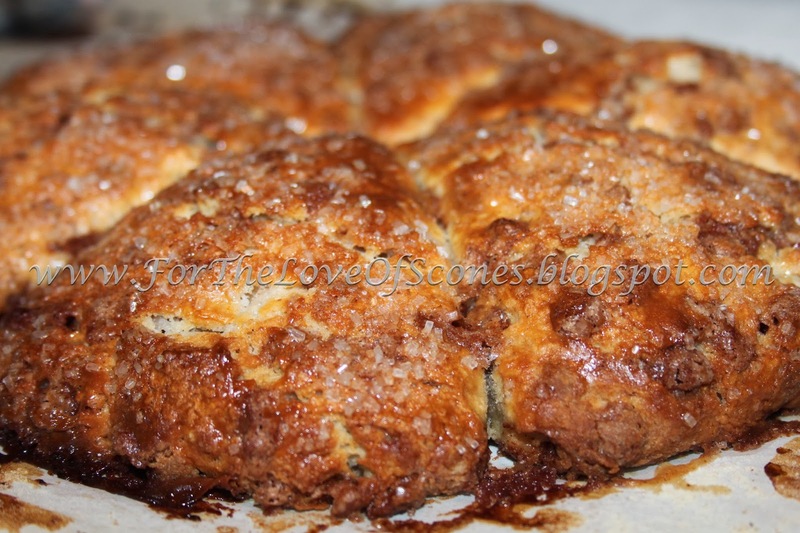 Not only do these scones smell divine, they taste great. They are crunchy on top and soft in the middle. 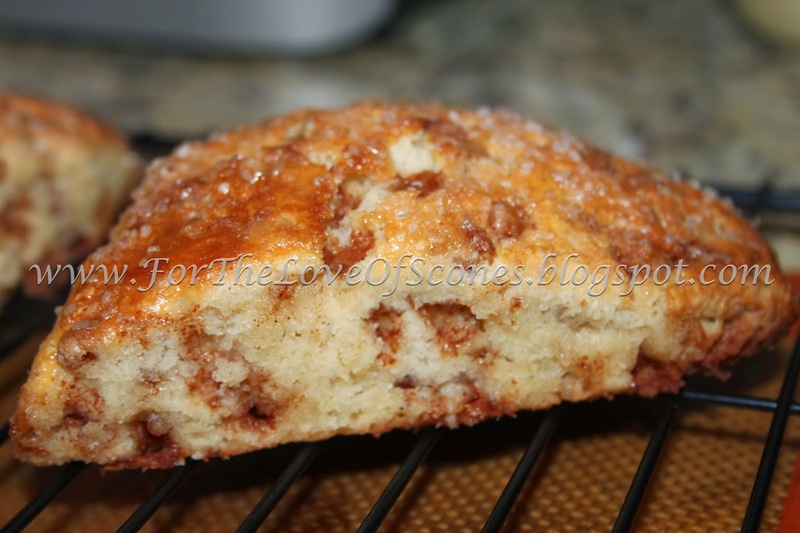 Although I prefer my scone flakey, these have a wonderful flavor and delicious crunch, and are to be a sure hit with those who like more cakey scones.